Where Entertainment And Education Come Together! A Place Where Learning Is Always Fun! An Ever-Expanding Curriculum Designed To Meet All Your Needs! Each of our animated Torah Town Episodes are based on a daily Parsha reading that will take your child through the Bible, teaching them the core values that Yeshua (Jesus) himself taught. Every video has a FREE Resource/Activity Book that corresponds with the teaching. In Addition, we offer an ever increasing list of Scripturally Sound music videos and teachings that can be enjoyed by the whole family. All of our lessons are designed to both entertain and educate children on the written Torah and how it points to our Messiah, Yeshua (Jesus Christ). You will find that our Home Schooling Curriculums cover a wide range of subject matter for you to choose. We are constantly expanding our library of worksheets and puzzles so you will find many activity pages to download and use. We are dedicated to providing you with the materials to help you "Train up a child in the way he should go." We strive to be an Ideal resource for Home Schoolers or for anyone wanting to bring the Word of YHWH (GOD) to their Children! It is our prayer to be an instrument that will bring His Word to children all over the world in a fun, unique and entertaining way. Torah Town is special due to the uniqueness of it’s content. 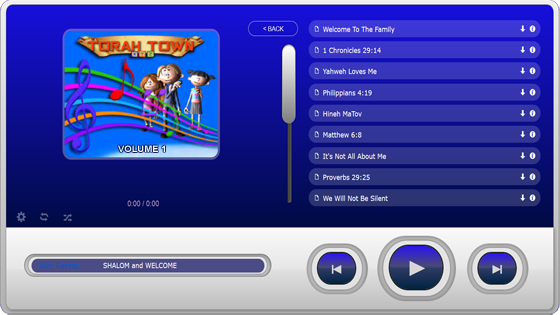 Torah Town is a complete scripturally based website for children as well as parents to come to for education, entertainment and fellowship. Our goal is to make Torah Town a special place where families can receive Bible knowledge and understanding of the Torah in a way that is fun, informative, and can challenge children to grow in the foundation of their personal walk of faith with our Creator and His Son. We offer many unique ways for the entire family to discover and learn about scripture. Coloring pages, lesson books, activity guides, video games, movies and shows. We now have our very own MUSIC PLAYER! Click on the image to the right to enjoy a variety of worship music. Torah Town is designed to be a central hub for all to be able to receive “The Good News of the Gospel”. With animated videos, games, puzzles ect. for children to learn and enjoy, as well as teachings and lessons for Home School parents to incorporate into their lesson plans. Our goal is to teach our children the Holy Scriptures from God’s word the Bible as a whole, with the foundation being the Torah, His commandments, and laws that we should follow, along with the LOVE of Jesus /Yeshua and the sacrifice of His shed blood for all mankind. We feel that it is vital for the day and time that we are living in that we “Train up a child in the way he should go...” in order to prepare them for the day in which they will have to “stand firm, in the good fight of faith”. We pray that you will join us on our journey to shed light in a time of darkness, as we preach and teach others about the desire of our Father Yehovah to see all turn around repent and become believers of Yeshua/Jesus Christ. We firmly believe that if we instill a interest and desire of God’s Word in our youth, that in the last days they will be the great and mighty leaders to usher in the Great Day that we all so anxiously await. We pray for Love and Blessings to all! I love how my kids can see the Torah portion played out in a way that makes it easy for them to understand in both video and the workbook . I loved it! I watched the entire episode. It really ministered to me. And I loved the umbrella! You are amazing and we know Yah is using you to bring up this new generation with strong foundations. We will keep praying and supporting what you do!!! It is Our Prayer to bring the Love and Knowledge of Yeshua Hamashiach (Jesus Christ) and His Torah to Children All Over the World in a Fun, Unique and Entertaining way and to provide High Quality, Biblically Based Educational Materials to Anyone in Need, Free of Charge. Explore Torah Town and take advantage of any of the materials we have to offer. It is our desire to provide you with the resources you need to teach and equip your child with the knowledge and love for our Messiah and His Word. If you have a need for something specific, please feel free to contact us. "Torah Town is a much needed resource for anyone desiring wholesome, biblically sound material for their child or grandchild." "The greatest legacy one can pass on is not money or other material things accumulated in one's life, but rather a legacy of character and faith." Thank You for allowing us the opportunity to share what the Father has laid upon our hearts to give. Things around us are changing rapidly as the "end times" draw near. In order for our children to be spiritually grounded in their faith and able to fight the spiritual battles that lay ahead they need to be prepared. If we equip them with God's Word, and teach them the love of Yeshua (Jesus) , what better gift could we give them. Thank you for your dedication and for your desire to seek a greater understanding of Scripture for the children.